Andrea Gatti and Rusty Lucey were promoted to Detective Sergeants on Tuesday, October 14, 2014. This step was taken to bring Detectives Unit up to date and all staff within the unit will be Detective Sergeants. 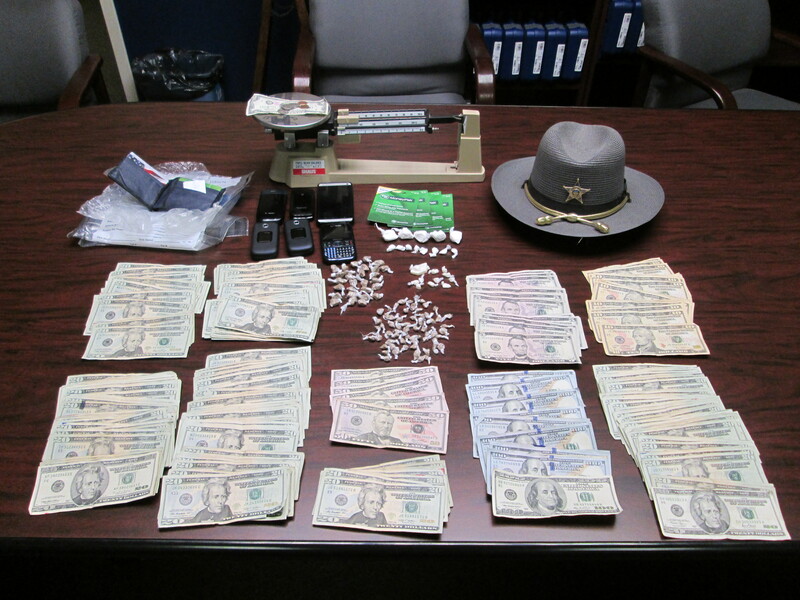 During a routine traffic stop on US 40 near Blaine, a large amount of drugs and money was taken off the streets of Belmont County. A Belmont County Patrol Deputy made the stop and upon investigation found the suspect to be on Federal Parole and asked for permission to search the vehicle. Martins Ferry Police Department was contacted and asked to assist with their K-9 unit. When the K-9 unit arrived, the suspect was asked to step out of his vehicle. While the K-9 was walking toward the vehicle, the suspect fled and was apprehended and restrained. The suspect’s vehicle was towed and is awaiting a search warrant. 81 grams of illegal drugs including heroin and cocaine and over $7,000.00 was put into evidence. 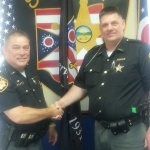 Deputy John Thorman was promoted to Jail Sergeant on 9/23/2014. Seen is Sheriff Lucas pinning on his Sergeant bars. 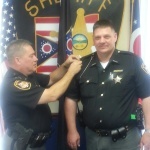 Deputy John Thorman was promoted to Jail Sergeant on 9/23/2014. It’s called “Operation Short Shield.” News9’s Kate Davison climbed inside of a cruiser for a special report on how the collaboration between law enforcement agencies brings results. 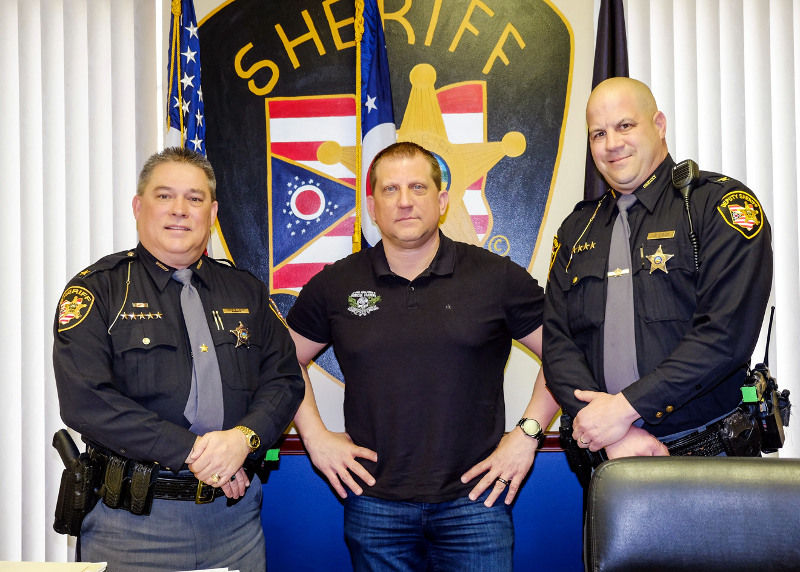 Shield detail involves numerous agencies coming together for one common cause — to enforce the law –in two separate facets: Criminal patrol and OVI patrol. Last Friday night, Sgt. Jason Greenwood with the Ohio State Highway Patrol let NEWS9 tag along with him. The ride along was nothing less than eventful. The event included more than 24 units and 36 continuous hours of patrol. “We aggressively are looking for criminals, people that are operating vehicles while they’re impaired,” said Lt. James Faunda of the OSHP. 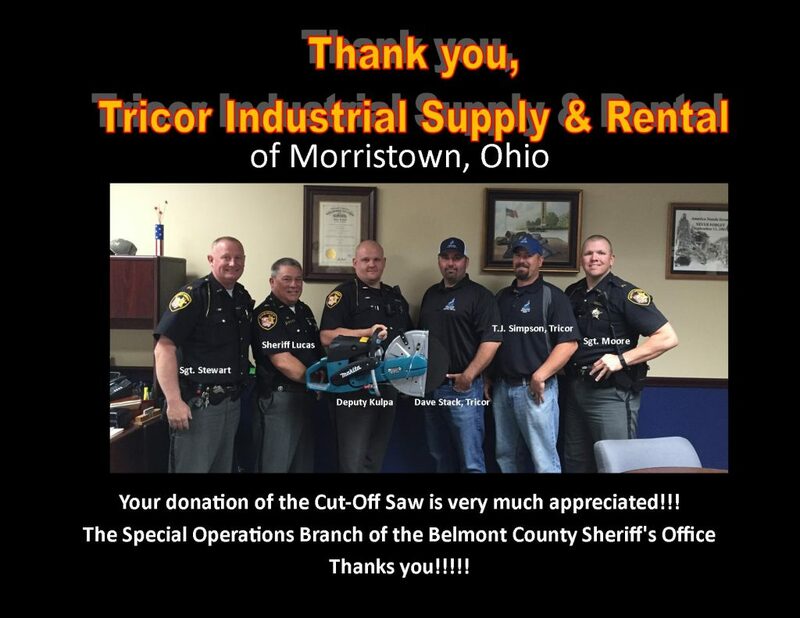 And a focused approach between members of the Belmont County Sheriff’s Office, Ohio State Highway Patrol, Martins Ferry Police and the Belmont County Drug Task Force. 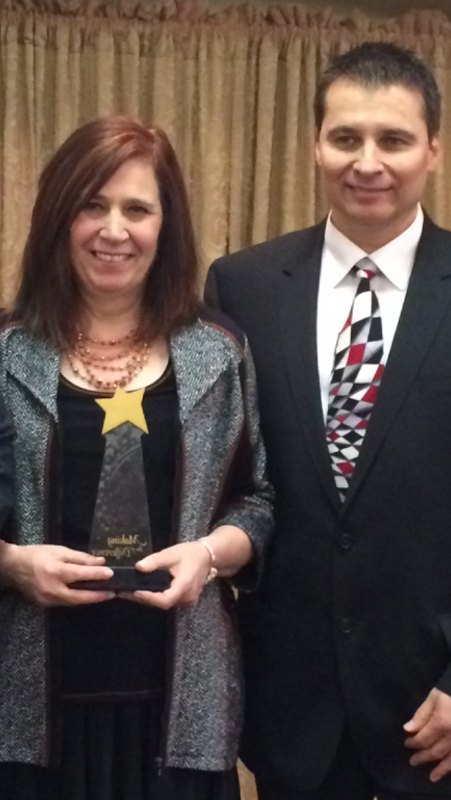 Its success rests on a combined effort of the agencies. 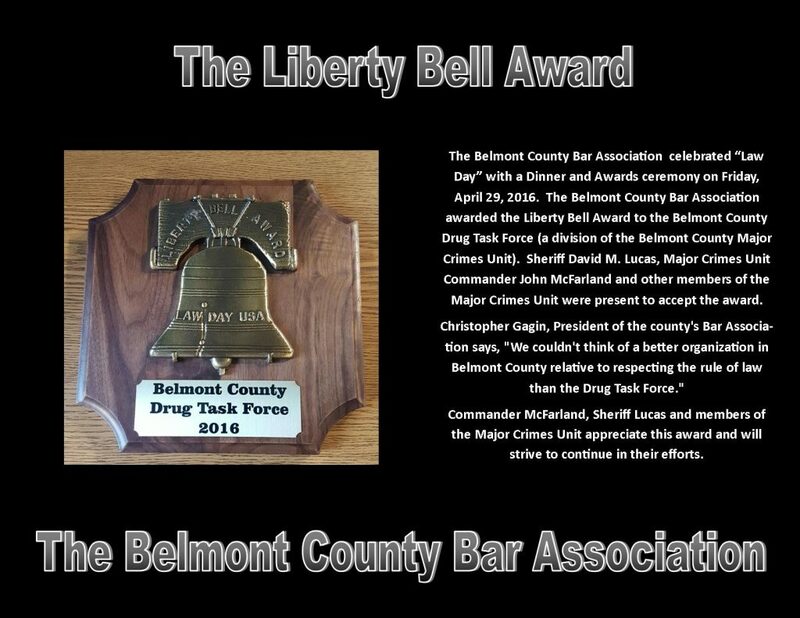 “We all know that we have a problem, from alcohol to drugs and criminal activities,” Belmont County Sherriff Dave Lucas said. There is now a reward in place for information leading to the arrest and conviction of the individual or individuals involved in the murder of a former Powhatan mayor. On Thursday, family and friends of Brown announced they have started a reward fund through Belmont Savings Bank. Currently, the reward stands at $20,000 and is still growing. If you have any information on this crime, the Brown family is asking that you contact Detective Ryan Allar at the Belmont County Sheriff’s Department at 740-695-7933. 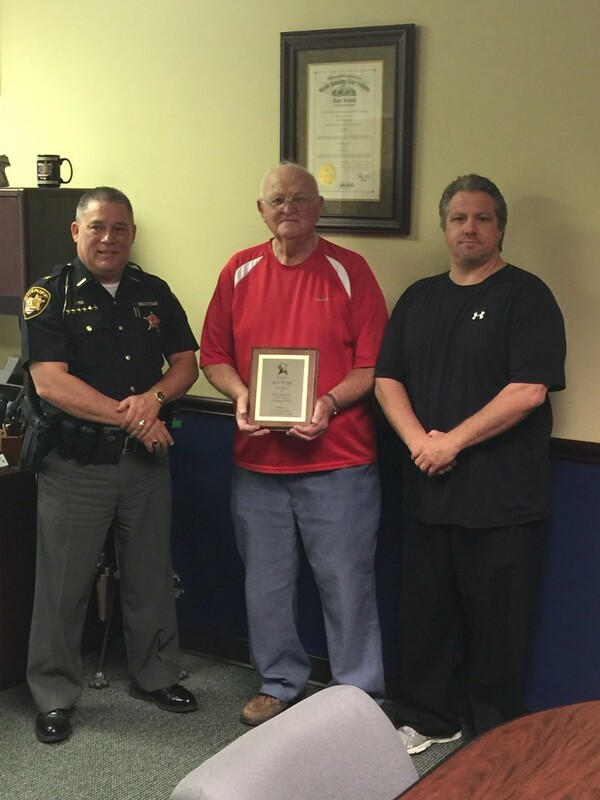 Joe Kutcher was recognized for 25 years of service with the Belmont County Sheriff’s Office. Joe retired on September 30, 2013. Joe started working at the Sheriff’s Office April 18, 1988 under Sheriff Tom McCort. He then served under Sheriff Fred Thompson and Sheriff David M. Lucas. 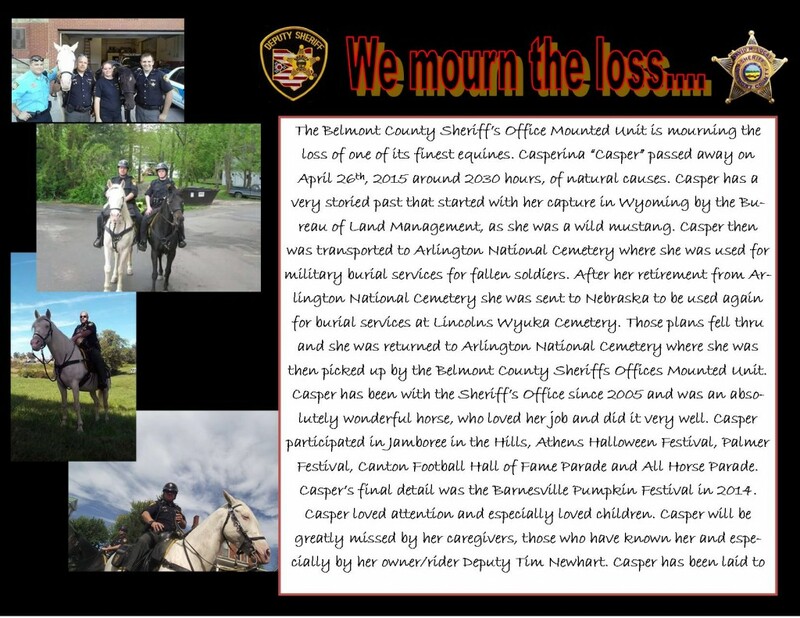 He worked in the Administrative Maintenance/Janitorial position his entire career with the Belmont County Sheriff’s Office. Joe was liked and respected by all the staff at our office and will be truly missed. 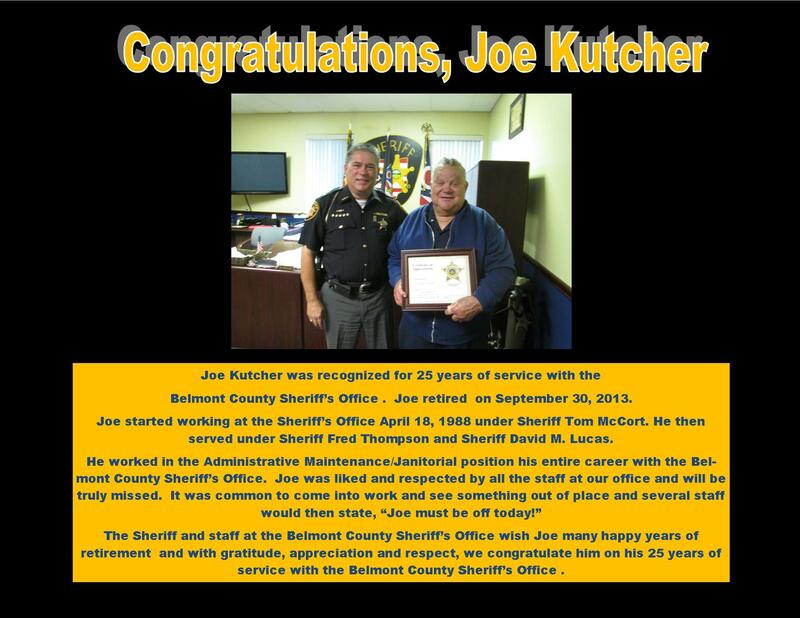 It was common to come into work and see something out of place and several staff would then state, “Joe must be off today!” The Sheriff and staff at the Belmont County Sheriff’s Office wish Joe many happy years of retirement and with gratitude, appreciation and respect, we congratulate him on his 25 years of service with the Belmont County Sheriff’s Office. 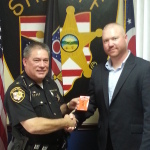 The Belmont County Office recognized two deputies for their outstanding job performance in the month of March. Recognized were Deputy Jason Schwarck and Deputy Jordan Blumling. In honor of their hard work and dedication, the Sheriff’s Office presented them with gift cards. 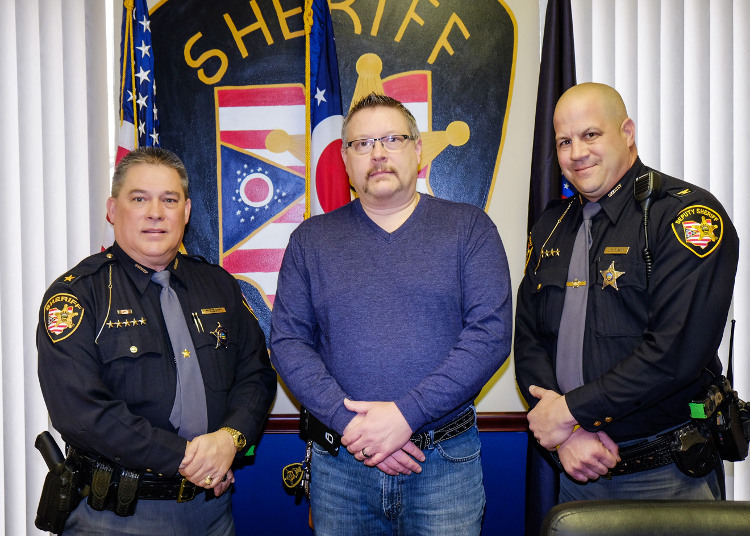 The Sheriff’s Office will award two deputies monthly in appreciation for their devoted service to the citizens of Belmont County and the Sheriff’s Office.